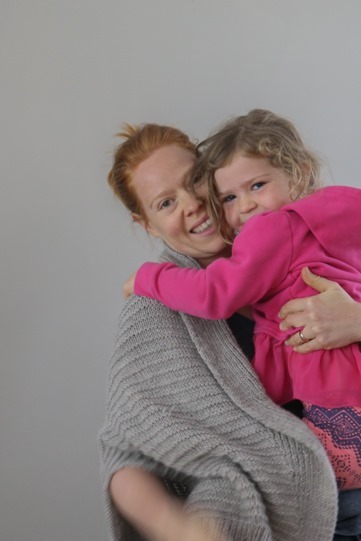 My friend, Jess, knit an amazing poncho recently and it looks AH-Mazing on her. Amazing. It suits her shape and silhouette perfectly. So I decided to knit on too! It totally felt like that moment on the playground when you’re little and you’re getting left behind for some reason, so you start jumping up and down, shouting, “Me too! Me too!” This was totally one of those situations. Completely! I wanted my sweater to look amazing … too. But we are a different shape and that right there, caused me to have problems with my sweater. 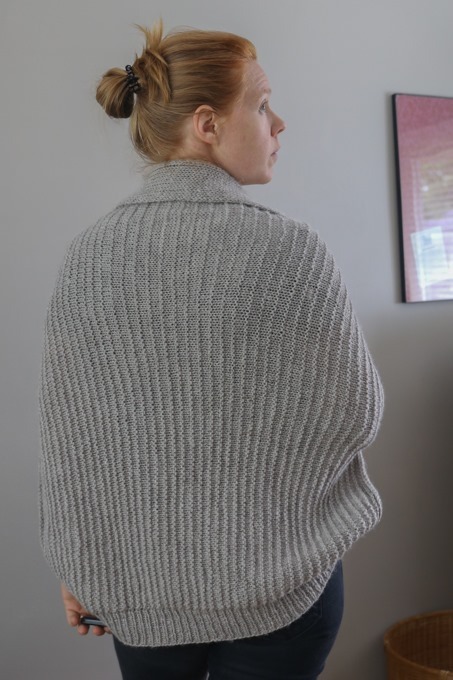 Back-to-back, I knit two ponchos in the past year – one turned out and the one I’ve just mentioned? I’m still on the fence. The one worked out pretty okay and I’ve worn it a couple of times. I’ve had to pull on it and re-adjust it but overall, it’s been a good little item. The lack of short row shaping (or any shaping for that matter) causes most of the concerns I have about this pattern. I thought about modifying it but I never did. I’m not sure I regret it per se but it definitely results in pulling at the neckline as I’m wearing it. The back and front rise across the yoke at the same rate so the front isn’t slightly lower, as it needs to be to compensate for the neck. The physical body needs room for that anatomical structure! Instead, the garter neck is picked up around an opening and rids up against my throat. This results in constantly pulling at it. Does it lessen the cuteness of the sweater? No, not really. But it lessens the wearability and comfort for ongoing, continued wear. I also messed up on the lace repeat – not than anyone would ever notice but the repeat is supposed to be worked back to back to back – not with 5 or so stitches in between. This just means that my poncho is less lacy. Does it really matter? No, not really. I kind of like that it’s not see-through because I can be a bit more liberal about what I chose to wear underneath (ie. prints). 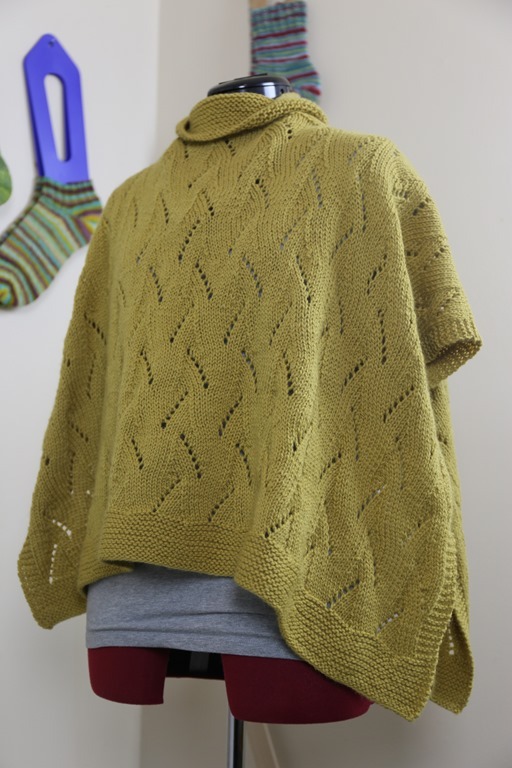 And I really like the results – I like the style and look of this poncho. I added length to the shawl as well. I think in total, I worked the lace charts two extra times on each side and I could have added another 1-2 repeats I think but I ran out of yarn. Now for the fail. This is an interesting construction and I read the pattern wrongly so I needed to re-knit the back twice. I missed about 8 inches of knitting the first time. The second time through, I think I was so frustrated that I just cast it off and left it. Before I write anymore about this sweater, I’m going to go upstairs and weave in the ends, then wash and block it. Who knows? Maybe it’s saveable! 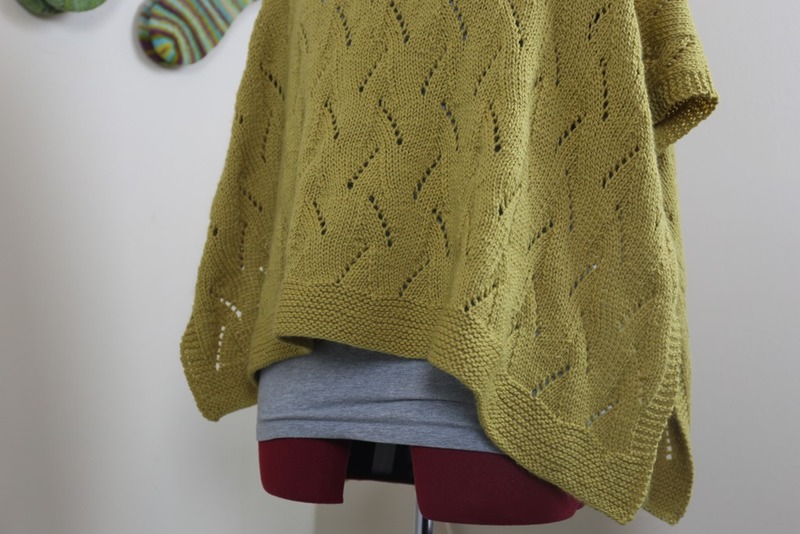 This second poncho was cast on last summer while the kids took outdoor swimming lessons. It was hot last summer and I remember knitting on the pool deck in the summer sun. To say it was warm on my lap is an understatement but I remember really enjoying this knit! I worked on it while I was sick in bed over a weekend in late summer to finish it off, realising afterwards that I’d left out about 6 inches of knitting. I was so disappointed! This sweater has kind of had one mishap after another. After washing and blocking it, I noticed immediately that there is a hole in the ribbed collar from ends I wove in but that came undone in the finishing process. I have to say, I’ve been very lucky with ends and finishing – I haven’t experienced this many times at all and it’s more annoying than anything since it’s completely fixable. This yarn is not my favourite yarn to work with; however, it serves a purpose and is machine washable. It’s a superwash yarn mixed with nylon. I bought some of it on sale at my LYS in purple (see my South Bay Sweater from Part I) and some cream that is earmarked for a sweater in the fall. The yarn feels like a nylon mix – it’s not particularly ‘soft’ although I use that terms loosely. I’m not a huge fan of using softness to describe yarn quality. It’s not scratchy and it has a good twist angle in it to create strong yarn. I would have loved it if it were 100% wool, untreated. It doesn’t make it terrible that it’s superwash – there is a lot of miss information about superwash out there – but I won’t buy more and more and more of this yarn for my stash because, as you may know, I prefer to knit from my handspun anyhow. I have large quantities of fibre that I’m excited to spin and knit into sweaters over the next few years. Regardless, this doesn’t feel particularly wearable and yet, since finishing it and weaving in the all the ends (and fixing the collar), I’ve reached for it more times than I care to admit. 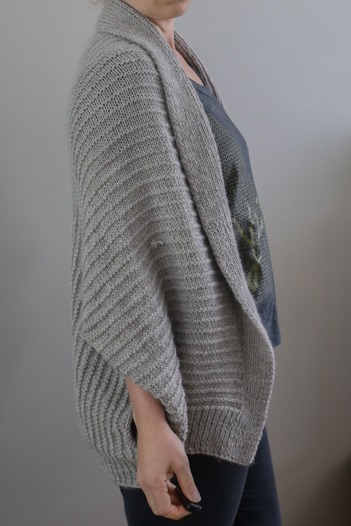 We have been having some funny weather lately and with a cool wind, this sweater is great for sunny/cloudy/windy/sunny/repeat. 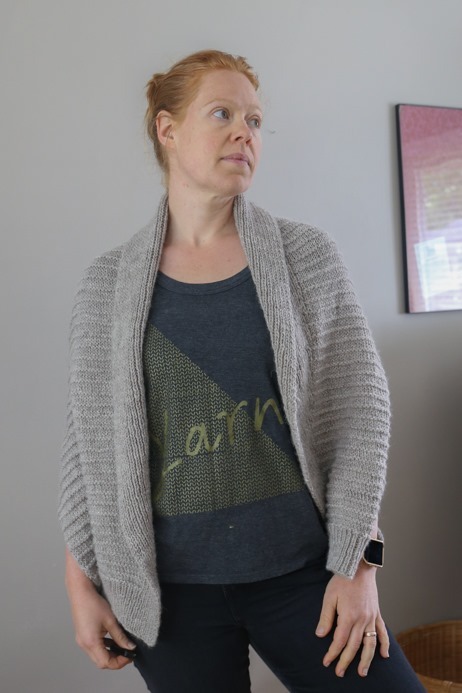 While I’m not sure I would knit this again, I’m really pleased that I took the time to knit it and re-make it when I needed to add that fabric to the back. I am also reminded that this is why things need to be blocked – it didn’t fit particularly well before washing but after some strategic pulling while it was still damp, it’s pretty great. Enough said! In the final installment of this series, I’ll chat about a couple of fitting issues I’ve had recently and what I would have done differently. 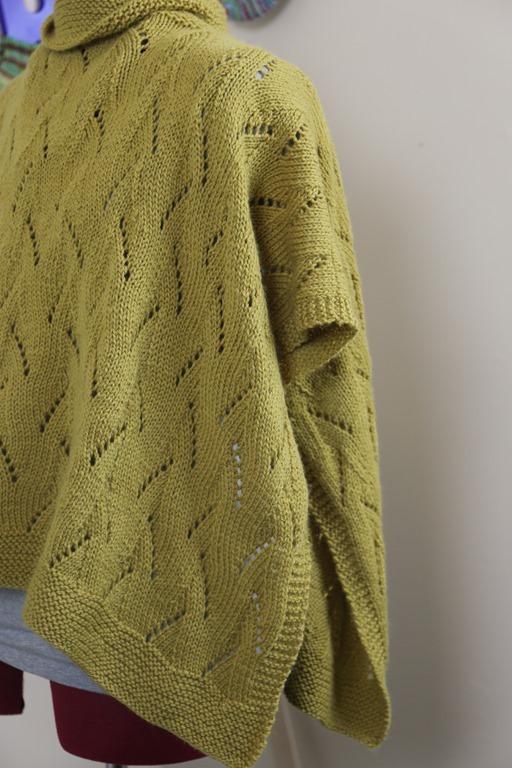 Until next time, happy poncho knitting! That doesn’t sound like a fail to me! Did the yarn dry normally this time?? Anymore the only measure of a successful sweater to me is how often I want to wear it. If I were more into dressing creatively, maybe I’d feel differently. But in this season, usefulness is everything. Also does your shirt say YARN? I love it!